Good Morning! How are you today? I'm doing well. The sun is shining and I will start my work at home today. During daytime I'm working as a PR Manager in the corporate world. Unfortunately I still haven't created a home office. In my daily search on the internet I found two lovely home offices. 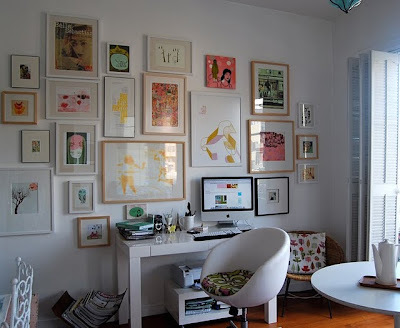 Can you imagine to have such a lovely office at home? What do you think? I love the first picture - that would have to be the dreamiest home office ever where I could imagine spending a lot of time day dreaming! The first one is gorgeous. 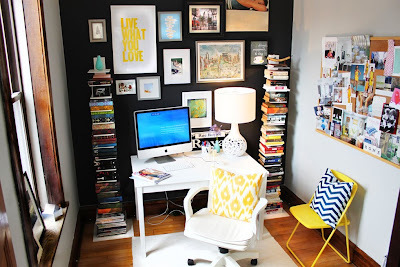 I love my home office - my BF asks why I don't move my bed in there - but its not as pretty as these. Thanks you all for your lovely comments! Ashlina: thanks for mentioning me on your lovely blog! Much appreciated!